Noknoi Uraiporn did this excellent album back in the 70ties - it is a split Album with Noknoi Uraiporn on Side A and Chutima Duangpon ("Fon dok Laew" featured on "Siamese Soul - Thai Pop Spectacular" Vol. 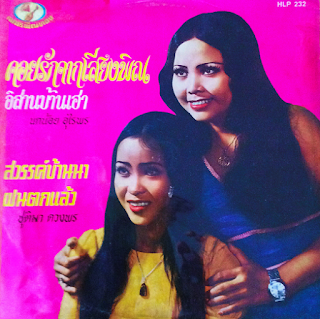 2) on Side B. Noknoi has the Phet Pin Thong Band backing her, but this record is a nice mix of ballads - which are luckily not as cheesy as other Molam singers attempts at Luk Thung - and groovy Molam tunes. Actually Miss Uraiporn is still touring with a big Molam group, but the sound is not as raw and funky as it was back in the 70ties. Please forgive me for just posting the Noknoi Side: Enjoy!